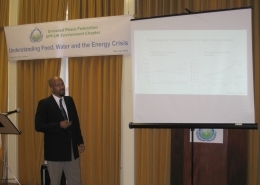 Dr. Yacob Mulugetta, Deputy Director of the Centre for Environment Strategy of Surrey University presented a thorough analysis on issues of food, water and energy crises that humankind is facing today. He described the daunting prospect of the 'perfect storm' of multiple resource deficiencies. He concluded his analysis quoting Martin Luther King’s call for change of values, ‘Revolution of values: I am convinced that if we are to get on the right side of world revolution, we as a nation must undergo a radical revolution of values. – We must rapidly begin the shift from a “thing-oriented” society to a “person-oriented” society.' Read More..